Where to put poems based on words with ancient etymologies? A dictionary, of course, a big fat dictionary housing all our English words and their origins. These days a dictionary is something of a fossil in itself. So few people use them that putting the poems in the pages of one at my local library felt as if I were burying the poems to be resurrected by archeologists of the future. Who knows when the physical version of these poems will resurface? 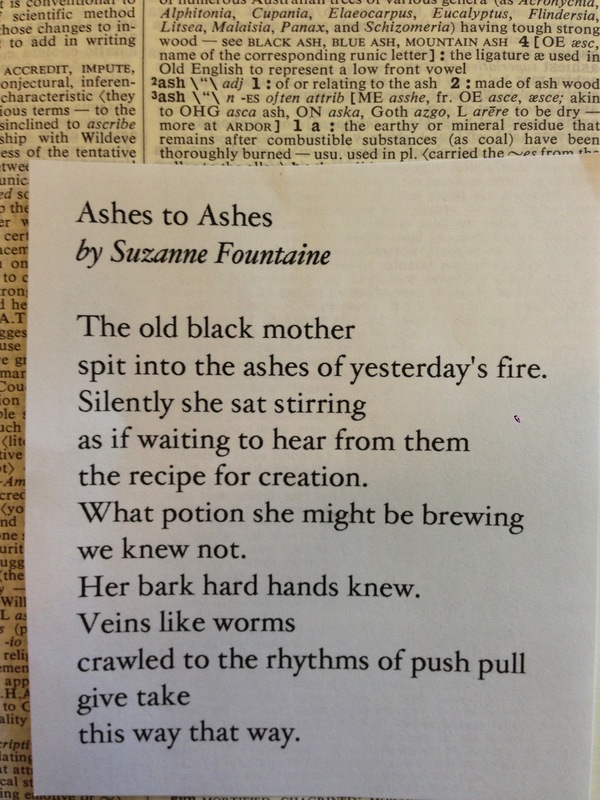 I put each poem next to a dictionary entry that was a key word in the poem. The first poem is a collaboration from a group of nine women who call themselves the “Literary Ladies” of the Providence Aged Care Facility in Victoria, Australia. The Literary Ladies is the only nursing home poetry group in the University of the 3rd Age, a worldwide ongoing learning program for seniors and the disabled. 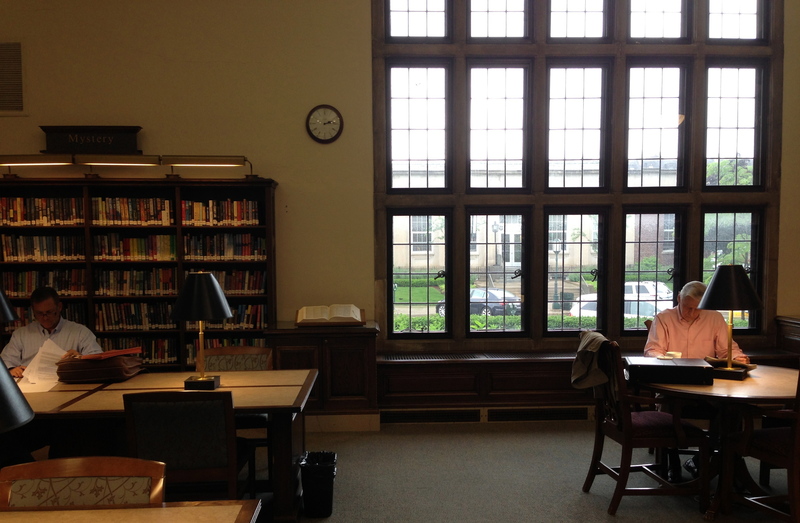 The poets, all in their 80s and late 90s, meet twice a week to write poetry. Facilitator Robyn Poul transcribes their lines on a white board and takes the poems home to type up. 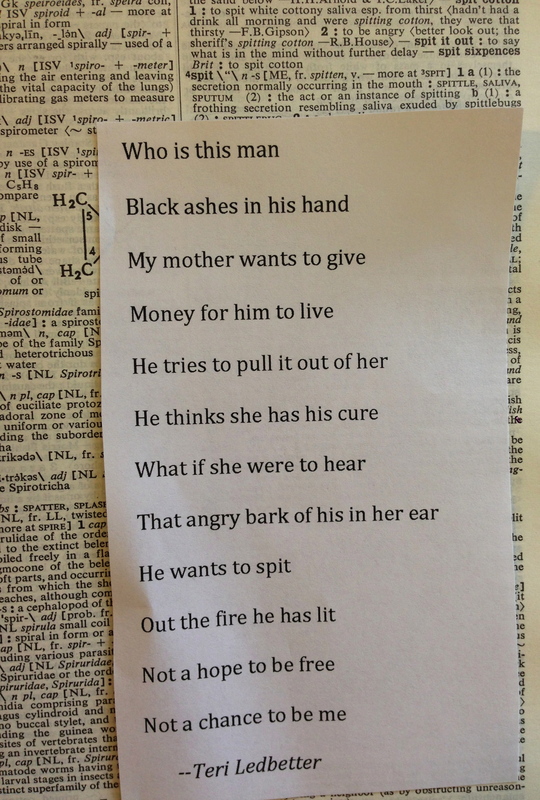 Here, in their own words, is how they approached this poetry challenge: “We thought that the words were so old that we had to give them some religious or spiritual significance. So we wrote a religious chant or prayer. The slow rhythm and repetition creates a picture of a ceremonial pace – a walk with an ordered crowd chanting together.” I put “The Mother” near “bark,” because I love the lines, I am Bark/to protect/to warm. It’s a marvel of the modern age, isn’t it, that these wonderful women can at the same time connect with women from eons past and with present-day readers the world over. As Robyn the facilitator would say, cheerio, Literary Ladies! 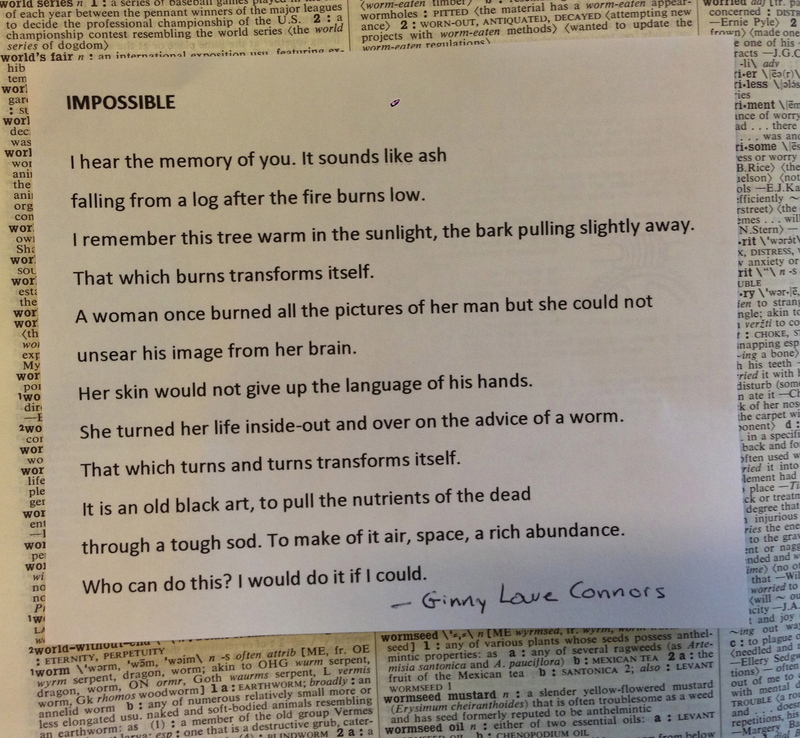 Ginny Love Connors’ poem “Impossible” is above the word “worm.” A worm, like the poet, like the “old black art,” can transform dirt/pain into something richer, something that allows growth. Bark hard and veins like worms are such strong descriptions of the old woman’s hands and unfortunately an apt one of my own that I think I’ll just give up on hand creams altogether. 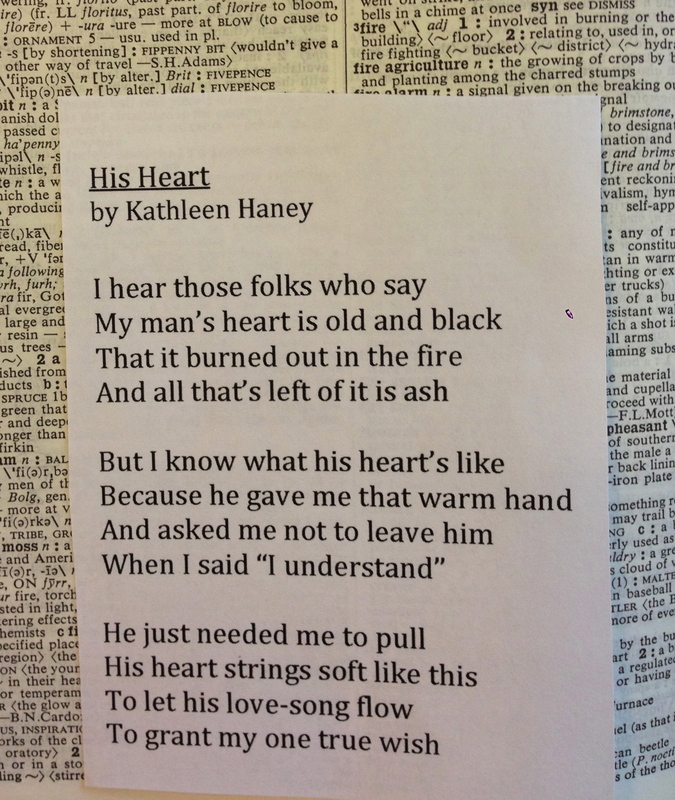 Kathleen Haney’s “His Heart” is right below “fire.” This poem sounds like a song to me, a song Lucinda Williams might sing in a voice full of experience, heartache and tenderness. 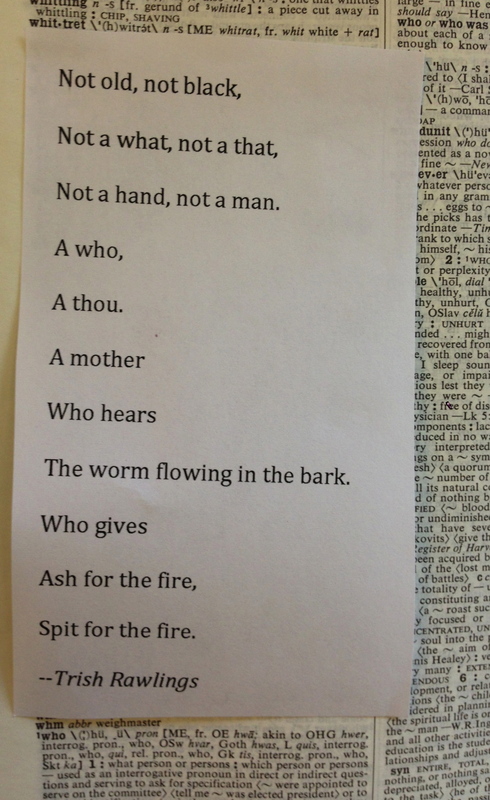 Trish Rawlings’ untitled poem, which I put above “who,” is composed almost entirely of words from the list. Quite a feat! It puts me in mind of a spell or incantation. Trish, please explain the sound of the worm flowing in the bark. It gives me the heebie-jeebies. 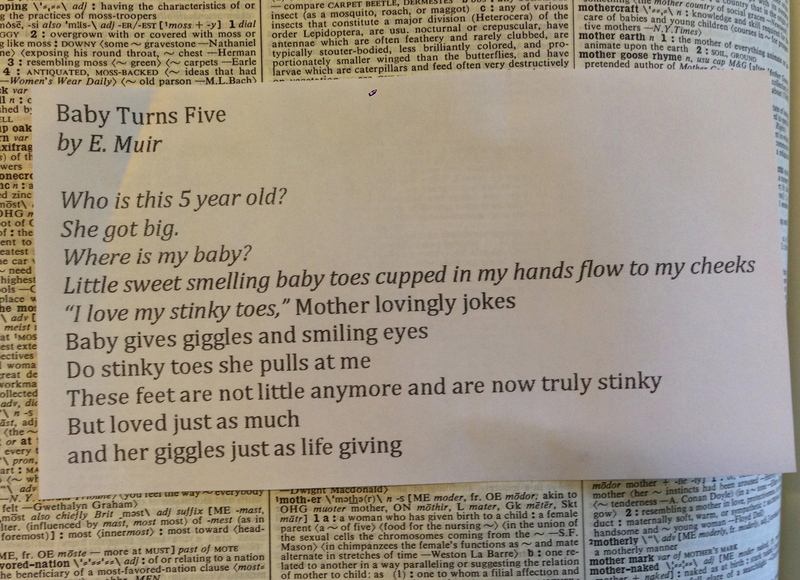 Finally, Teri Ledbetter’s poem. The situation is evocative and mysterious–is the man begging on the street corner or is he someone in her inner circle? At any rate, he’s an interloper, not welcome in the child’s world. HI Dear Poem Elf and the poets who submitted work for the challenging ancient word contest..I loved these! Amazing. Great results! Thanks for doing this! Thank you so much! Wish I could read Greek so I could see what you’re up to over at your blog. Side note: are you a Cavafy fan?